And all that's just 1 person! The origins of this highly calorific meal comes from the days when the peasant field workers would consume it to provide them with a full day’s worth of energy and nourishment to keep them going throughout the entire day. One thing's for sure, after devouring an entire bandeja paisa, you won't feel like eating else for the rest of the day. Yup – that's all just for one person…! Chicharron are deep fried crispy pork belly snacks, which look like thick slices of bacon but with a large chunk of fat and a slither of meat. They are popular in the Andean regions and either served as a standalone dish, or included as an accompaniment to dishes like bandeja paisas. Arepas are a breakfast snack and popular street food in both Venezuela and Colombia. They are deep fried corn cakes, which come in different sizes and varieties, depending on where you are. In Medellin and the surrounding area, arepas are usually small white and round, served as an accompaniment in place of bread. In coastal cities like Cartagena and Barranquilla, the arepas are stuffed with other ingredients to produce a more filling snack. One of our favourites is the arepas con huevo, which is stuffed with egg. It's delicious whether its served at breakfast, or as a snack to compliment a cup of coffee. Ajiaco is a chicken/potato soup, which is particularly popular in Bogota. The capital city is located deep in a mountain basin of the Andes, so has a much cooler climate compared to Medellin and the tropical coast. Therefore, hearty soups like ajiaco are very popular here. A typical Colombian ajiaco soup contains 3 different varieties of potatoes, as well as the galinsoga herb. Locally this herb is called guasca and interestingly in the USA it is considered a weed and referred to as gallant soldier or potato weed. In the UK it’s got an even cooler nickname – soldiers of the Queen. Try out our recipe for Colombian ajiaco. Patacones are fried plantain snacks, which are extremely popular in the coast. Plantains are similar to bananas, but they are thicker, firmer, have less sugar, more starch and can't really be eaten raw. They are relatively unknown in Europe, but ubiquitous all across Latin America. Every meal we had in Cartagena was always accompanied with patacones, usually with a spicy sauce to dip them in. The most common food here was a fried fish, served with salad and patacones. Aguardiente is a strong Colombian alcoholic drink made from sugar cane with an aniseed flavour. It's so strong that the name, aguardiente quite rightly translates as burning water. Whenever we went out, we'd order a bottle of aguardiente from the bar and would share it with friends, either neat or mixed with coca cola. Warning: the hangovers are lethal. We were told you can avoid this by ordering the aguardiente with the blue top because it has less sugar than the red top ones (the more sugar, the more severe the hangover). Despite this slice of wisdom, we still warn you to watch out for those aguardiente hangovers!! After aguardiente, rum is the most popular liquor in Colombia. There are many different types of rum made here, like Don Medellin, La Hechicera, Dictator and Parce. If you like your rum, you'll have a ball in Colombia. Just like the aguardiente, we'd order a bottle at a bar with friends and would share this between us, either straight or mixed with coke (the drink). We personally preferred rum over aguardiente as our drink of choice when partying – the hangovers are less severe! 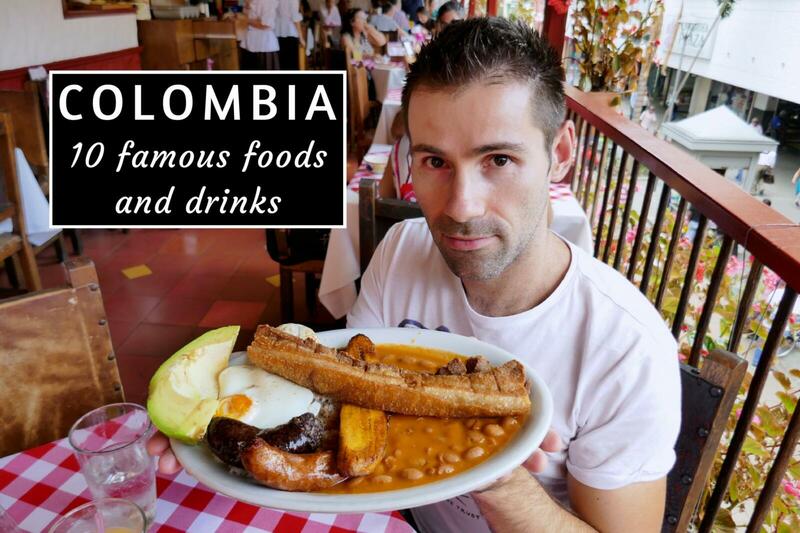 Colombian coffee beans are world famous. The area around Medellin, Antioquia, is famously referred to as the Coffee region, with many beautiful small towns and villages like Jardin and Guatapé, which we strongly advise visiting. Here, you can find some of the most delicious tasting coffee. A fun twist on Colombian coffee is mañanita, which is like an Irish coffee, but instead of whiskey, they use rum. Coconuts are very popular by the coast especially around the Caribbean beaches. One unique method of eating them is to slice the top open, mix in some liquor to the coconut water, and voila, you have a delicious Colombian cocktail called coco loco or crazy coconut! The most common liquors used are a mix of rum, vodka, tequila and whiskey. Check out our simple recipe for Colombian coco loco, which you can recreate back home. Fresh lime juice smoothies are popular throughout Colombia. They are extremely refreshing, and mixed with a bit of sugar, are delicious. A popular variation on fresh limonada is with the addition of coconut milk, or limonada de coco, a specialty around the coast. You can try out our quick and easy recipe for Colombian limonada de coco. The Columbian heart attack looks so good guys LOL. But only for a meal or 2. Something about that mix of meat and carbs. South American fare is so filling, so tasty and one meal a day usually does the trick. Brilliant. All of the food looks good. The more I learn about this beautiful land the more I want to pay a visit. Thanks for the rocking share guys.